A federal bankruptcy judge approved the liquidation plan for Dewey & LeBoeuf on Wednesday, a milestone in the winding down of the collapsed law firm that paves the way for creditors to recover tens of millions of dollars. U.S. Bankruptcy Judge Martin Glenn said on Wednesday that the bankruptcy plan is in the best interests of the creditors and the estate. “It is remarkable that only nine objectors filed (motions against the plan) as of today, and nearly all of them are resolved,” said Glenn of the swift nature of the bankruptcy proceedings in New York. 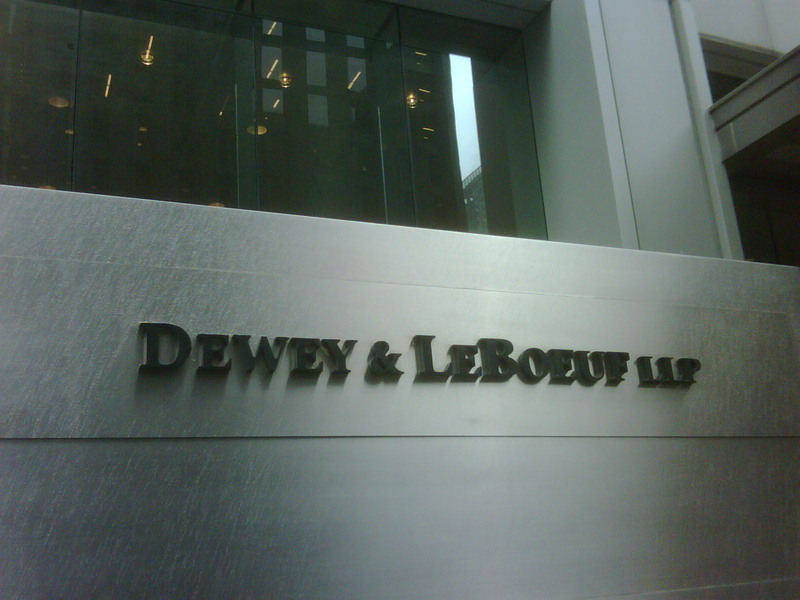 Dewey & LeBoeuf, which once employed more than 1,000 lawyers in 26 offices worldwide, last year became the largest U.S. law firm to file for bankruptcy. Its demise has been largely attributed to compensation guarantees the firm’s leaders made to many partners. Under the bankruptcy plan, more than 450 former partners agreed to pay the estate at least $71.5 million in exchange for a release from potential litigation. Those funds will now go to satisfy secured lenders such as JPMorgan Chase & Co., which have a total of $262 million in claims against Dewey, and an unknown amount from unsecured creditors. One unsecured creditor, the Pension Benefit Guarantee Corp., has a $120 million claim. The estate potentially could also collect money from the firm’s $50 million management liability insurance policy, which covers the actions of Dewey’s former leaders. Secured lenders are expected to receive 80 percent of the initial $67.5 million the estate collected from partners, while unsecured creditors, which include landlord Paramount Group and Thomson Reuters Corp for legal research, are expected to receive 20 percent of that amount, according to the plan. Any payments by partners to the settlement after the $67.5 million mark is met are expected to be split between secured and unsecured creditors, according to the plan. In the months leading up to the Wednesday confirmation hearing, dozens of partners had objected to the bankruptcy plan on grounds it favored high earners. Separately, retirees objected and said they shouldn’t have to pay because they were not responsible for the firm’s demise and were owed retirement payments. By Wednesday, however, many of those objectors had opted into the plan, saying that the cost of litigation outweighed their interest to continue to fight the plan.